This map shows the location of each site and the percent native species in each basin. The map shows a trend for lower percentage native species at more northern sites, so location matters! During the summer of 2018, I surveyed plants in stormwater detention basins throughout an urban and suburban area of central New Jersey. This study is aimed at improving water quality and wetland habitat by choosing the right plants for the job. Selecting appropriate sites for renovations and the choosing the best species to plant depends on many factors. Two important factors are the plants’ ability to survive in basin conditions and the natural tendency for certain plants to colonize basins regardless of what we plant there. One question I am addressing is how survival and colonization change depending on the surrounding landscape. Because catch basins at various locations receive different amounts of pollution and seeds, I expect to see different plants in different settings. How does the surrounding landscape influence the plant community in a stormwater detention basin? The adjacent land use and land cover influence wetland properties, including plant communities. Land cover is the type of stuff on the site, such as forest or roads. 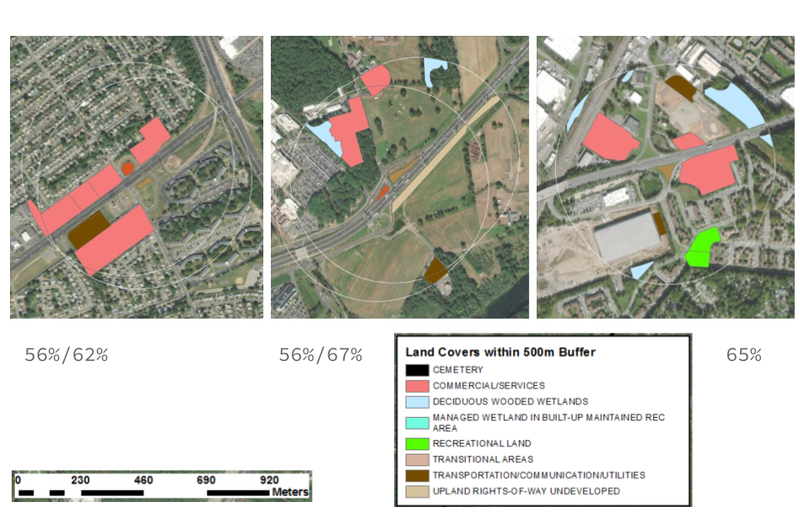 Land use is the activity that humans do on the site. Both factors affect plant communities. The surrounding landscape influences the plant community by the quantity and type of seeds available and by dispersal routes. One of the basic ways that plant communities are quantified is by the number of different species on a site, termed “species richness.” Paved roads around a wetland affect plant species richness and roads are particularly important dispersal routes for invasive plants. The proportion of native plants increases with forest cover in the surrounding area. In this analysis, I am using the land use and land cover within 500 meters of each catch basin to explore relationships between adjacent land and the proportion of native species in the basin. I used a computer program to do exploratory regression. That technique takes each possible explanatory factor and tests the strength of the relationship between that factor and the factor of interest. In this case, the factors are land cover types and the percent native species at a site. 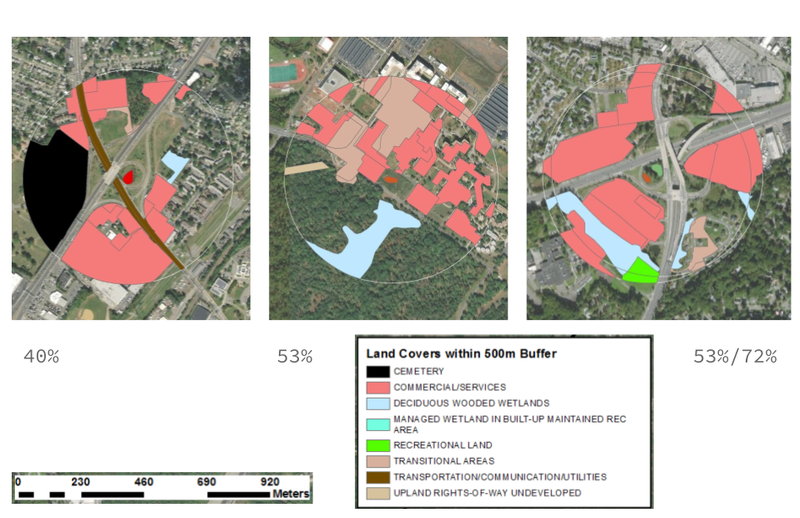 I found that more adjacent commercial and service area leads to a lower percentage of native species in a catch basin. Transportation and utility areas, such as power line right-of-ways, also contributes to a lower percentage of native species. On the other hand, the percent of native species increases when a basin is surrounded by recreation area and wooded wetlands. This series of zooms to each basin shows the percent of species at each site that is native and the most influential land covers. They are arranged from lowest to highest percent native species. The maps show that the amount of commercial or recreation area that surrounds a catch basin makes a big difference to the plants that live there. This result can help land managers decide which restoration goals are appropriate in different settings. For example, by the roadside, where there are more non-native species, a basin may be redesigned to filter pollution. Non-native species can perform this service as well as native species. However, in a park or recreation setting, where there are relatively more native species, a catch basin may be restored to include rare and sensitive native species. This analysis still needs fine tuning, but shows promise as a way to predict plant community characteristics based on the surrounding landscape.